We have arranged for a block of comfy, affordable, and environmentally-friendly hotel suites for attendees seeking accommodations. Patio at the Habitat Suites in Austin. 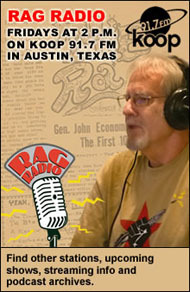 Hi, Ragstaffers and fellow travelers! UPDATE: There are no more rooms available at the Habitat Suites, though there is a hospitality suite for all Rag Reunion attendees. 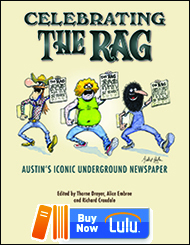 The upcoming four-day 50th Anniversary Rag Reunion and Public Celebration (“50 Years and Still Raising Hell!”), slated for October 13-16, 2016, in Austin, is coming together in unprecedented fashion and we already have heard from dozens around the country who plan to attend. 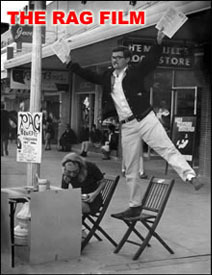 You can find the ever-growing schedule of events here, and much more about The Rag and plans for the 50th Anniversary celebration here. And now we can announce plans for accomodations. The Rag Reunion Planning Committee has reserved a block of rooms at a local green (and non-smoking) hotel where we are also booking a hospitality suite that will serve as a gathering place for attendees. Each suite has a large refrigerator and a microwave, a fully-equipped kitchen, and a couch in a separate living room that makes into a bed. 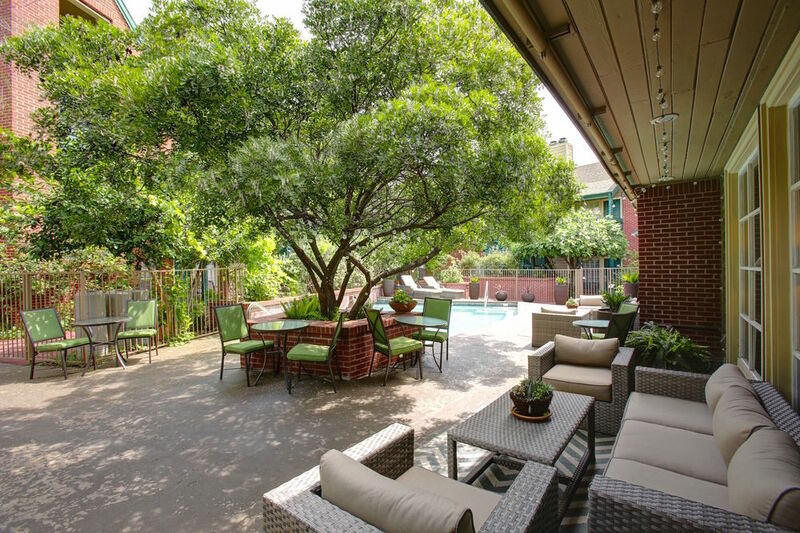 There is a complimentary breakfast, a free happy hour (beer and wine), and a saltwater pool. Smokers are advised to book the Red Roof Inn, 8210 North I-35, Austin, TX 78753, Phone: (844) 560-2848. No special rates have been arranged. 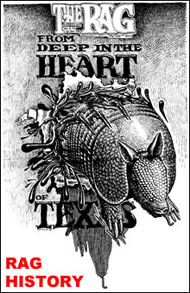 If you would prefer to stay in someone’s home, or, if you are in the Austin area and want to offer community housing, or you have any issues, including financial, please contact Bill Gordon, our Hospitality Coordinator, at reunion@theragblog.com, or call him at 512-453-4354. To communicate with the Rag Reunion Organizing Committee about other matters, use the same email address: reunion@theragblog.com. This entry was posted in Rag Reunion 2016 and tagged Alice Embree, Habitat Suites, Rag 50th Anniversary, Rag Reunion 2016, Reunion Accomodations. Bookmark the permalink. Love that you are doing this as it brings back memories of times not forgotten and wonderful people now ghost riders in the sky, and us still here below, hopefully making it though the September of our years and beyond in comradeship. Hope you’re able to join us, Doug. Lots of good planning. Can’t wait. This is so profoundly wonderful!! So proud of you all. Seeing it stopped my breath, for a minute. My brother wanted to attend SO badly, with excitement. In our last meaningful, and cherished, conversation, on his and Sabine’s balcony in Berlin, I asked him if there was any way I could help him. He thought, and decided he wanted me to take notes for a paper he wanted to contribute to the anniversary. We never got a chance to finish as he became too weak. He loved you people, and being “part” of The Rag, albeit in Berlin. He listened to the broadcasts, faithfully. As do I, here in NJ..I think we just want to stay connected. 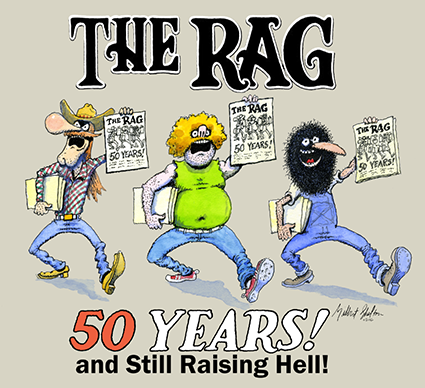 The continuing existence of The Rag gives people hope. Hope and community in these dark times.Thank you for being in his life, and mine. I wish there was some symbolic way Dave could be there. Dave and I WILL be there in Spirit. David MacBryde , PRESENTE! We will certainly feel Dave’s spirit (as we already do). Wish you could be here, Gretchen.